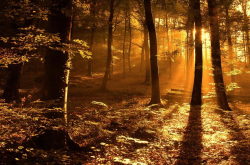 To add another dimension to the lives of people who wish to engage with Unitarian services of worship and celebration. Those thinking of attending a Unitarian church and wishing to sample a service before entering a church for the first time. 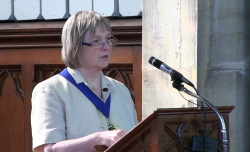 Congregations that do not meet ever week by giving them free access to more Unitarian worship and so encouraging them to watch the services together and meet more regularly. Give Unitarians not able to attend a congregation access to more Unitarian worship. Please click on the image to download our filming guide. 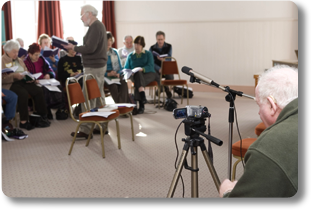 It helps congregations and other Unitarian groups understand what is involved in filming an event or service. 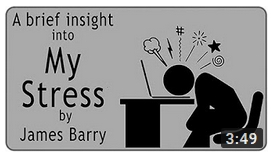 Please consider including an article about us in your newsletter. You can either 'cut and paste' information out of one of our newsletters (see the menu on te left), or contact us and we will send you an article. To improve the quality of our broadcasts and to enable us to set up more filming teams, we are asking groups and individuals to sponsor the purchase of the extra equipment we require. UKunitarianTV is funded soley on donations, please consider helping us. Cables £20 - A large number of cables are required to connect all the equipment. While we try and use wireless where possible it still all needs to be connected together. Audio mixer £50 - Recording a service in a place of workship requires having several microphones, the mixer connects all of these to the channel and can be used to ensure they are all at the correct volume and adjusted during filming. For example turning down the pracher's microphone and the one recording the music up during hymns. Radio Microphones £170 - When recording a service the audio is considered more important than the video. To ensure the whole service is heard clearly a number of microphones are required including ones to record the piano or organ and the congregation singing. We prefer wireless microphones to we do not need to have cables to the back of the church where we record the service. Webcasting Camera £500 - We film services from the back of the church that are often in comparatively in low light so good cameras are required. Film-making Camera £2,500 - Professional films requires professional equipment and if we are to make high quality films cameras like this is required. 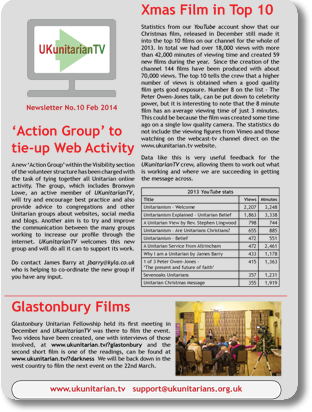 UKunitarianTV is an independent group who promote Unitarianism in the UK through online video. Our service is run by volunteers, currently there are three technical teams based in Manchester, Derbyshire and Sussex. 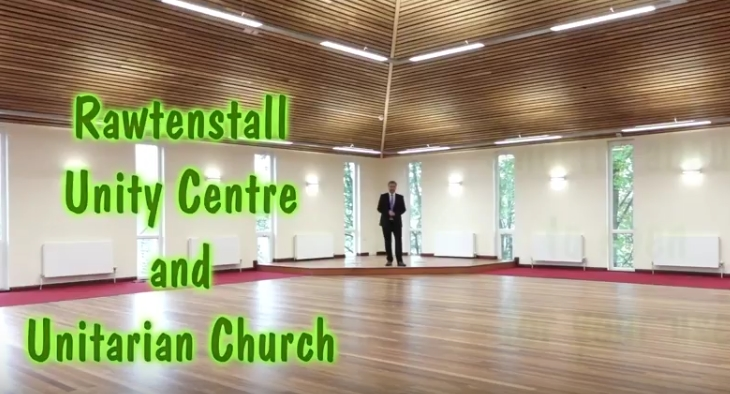 There are about 4,000 Unitarians in the UK who attend services on a weekly or monthly basis. With only approximately 170 congregations and fellowships there are areas of the UK that are not serviced by a Unitarian meeting place. There are also people close to a local building cannot always get to services either because of transport problems, other commitments or mobility issues. 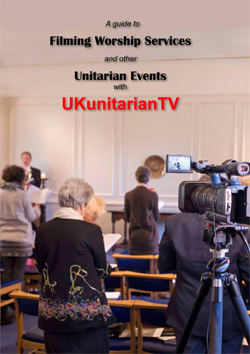 UKunitarianTV helps connect these Unitarians by producing online video material. 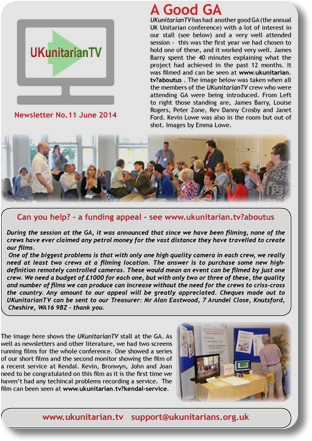 If you wish to contact us please email James Barry at support@ukunitarians.org.uk . We are always interested from hearing from individuals or congregations who wish to get involved in this existing project. 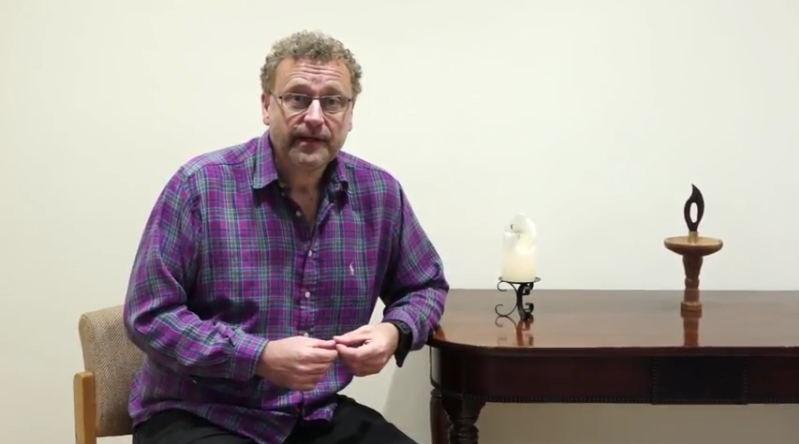 Each month at 7:30pm on the 1st Sunday there is a broadcast on our sister website www.sundaynightlive.tv. The contents of these programmes are varied, but always interesting to Unitarians. Please see the Sunday Night Live section of the film list on the right to see archive films. 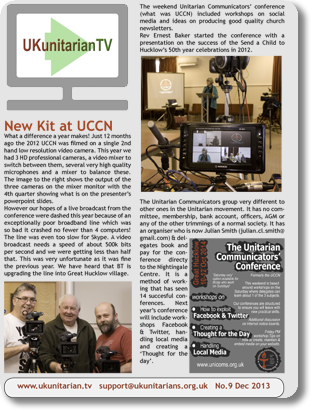 The Unitarian Publicity Group called Unitarian Communicators (formerly UCCN) runs a training courses each November. One of the three streams is dedicated to training anyone interested in the techincal side of web-casting and filming. Sessions will include using audio and video equipment and how to film a service. 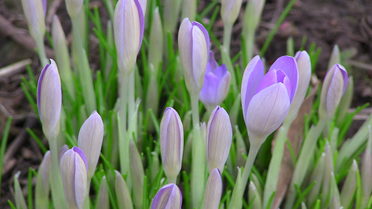 Worship Web - Unitarian Universalist worship resources. Hibbert Assembly - Material provided by the Hibbert Trust on topics for school assemblies. The Nightingale Centre - Holiday and conference centre in the Peak District. Send a Child to Hucklow - Charity holidays for under-privilaged children. UKunitarianTV consists of three group. We would like to thank the following people and groups for their very generous donations to UKunitarianTV.